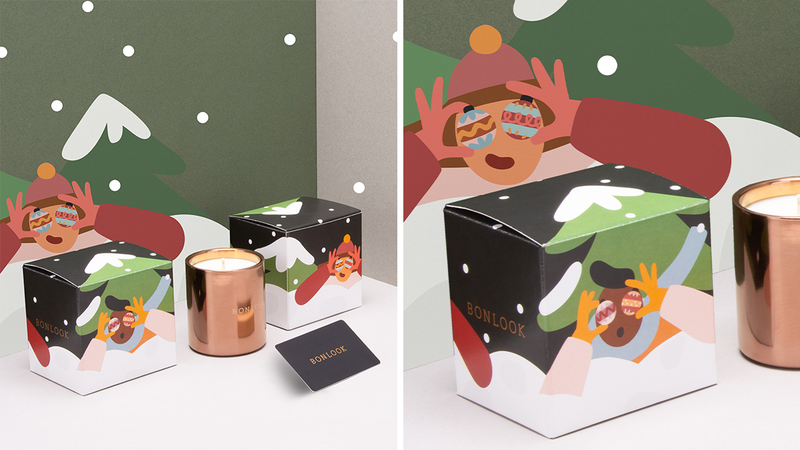 We spoke to Montreal-based illustrator, Cécile Gariépy, about the artwork she did for BonLook. Cécile Gariépy is an illustrator whose art features playful, cartoonish characters that are so bold, they pretty much come to life, like a pop-up book for the design-inclined. Originally from Quebec, Cécile’s unique perspective has garnered her international acclaim: her illustrations have appeared in The New York Times, Nylon, and Afar Magazine. She’s also partnered with brands like Spotify and Aesop. Now, we’re adding BonLook to that impressive list. From her unabashed use of colour to how she emphasizes—even exaggerates—the features of her characters, Cécile’s work is more than just easy on the eyes, it tells a story, too. To capture the spirit of the holidays, our creative team partnered with her. In honour of this collaboration, we asked Cécile a few questions about her creative process, what inspires her, and what she’s got planned for the holiday season (and beyond). What made you decide to become an illustrator? This is a tricky question for me to answer, because becoming an illustrator wasn’t even a decision I consciously made. My background is in film, and prior to getting my start in illustration, I had already been working as a director for five years. I only started drawing when I was studying for my master’s degree in Paris. It helped me take my mind off of things while writing my thesis. I started posting these drawings to my social media accounts without thinking that, in just a few months, I’d be going through a career change. I have to say, this has been a happy surprise. What was the inspiration behind the work you did for BonLook? I love taking well-recognized cultural symbols and reworking them my own way. For example, the ornaments I featured are everywhere during the holiday season. I wanted to play up their round shape and transform them into glasses. The playful nature of these pieces really puts us in the holiday spirit. Tell us a little bit about the creative process involved in bringing these images to life. My creative process kicked off after a very constructive conversation I had with Tania Fugulin, BonLook’s creative director. At first, I proposed some conceptual ideas, and together, we were able to come up with some ideas that would wind up being the most impactful for this campaign. What’s a holiday tradition that you hold near and dear to your heart? I love spending time at my parent’s cottage in the Mauricie region of Quebec. All we need is some smoked salmon, bubbles, and a game of Scrabble. I have several projects on the table, but more than anything, I’m looking to find a balance between work, rest, and travel. I didn’t take enough time for myself in 2018 and I intend on doing something about that! I like travelling to Asia and the Middle East just as much as I enjoy escaping to Natashquan, in the northern part of Quebec. My preferred destination changes with my mood. Who are some illustrators who inspire you? The list is long, but to name a few I’d say Geoff McFetridge and Matt Blease for their sharp, witty minds, Yukai Du’s landscape images are beyond compare and Isabelle Arsenault and Michelle Lemieux for their drawings, which I find to be nothing short of poetic.